Dr. Jong H. Kim, professor of music and director of choral activities at University of Lynchburg, has been invited to be guest conductor for the Incheon City Chorale, a professional choir in Incheon, Korea. Dr. Kim will begin rehearsals with the choir on May 8 and present a concert on May 21 in the Incheon Metropolitan Arts Center. The concert, “Choral Landscapes,” will feature choral masterpieces by twentieth century Northern European composers, such as Eriks Esenvalds of Latvia and Veljo Tormis of Estonia. 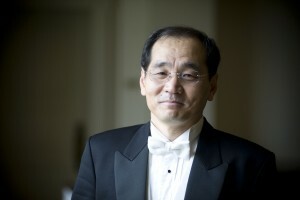 “This is a big honor personally,” said Dr. Kim, “since they only invite very few highly recognized conductors from all around the world to conduct their choir.” This will be his second guest conducting appearance with this group. He also conducted the choir 15 years ago. Known for its extraordinary musicality, the Incheon City Chorale consists of 40 full-time professional singers. The group has performed throughout Europe, Asia, and the United States, including the 2002 World Choral Games’ Gala Concert in Busan, Korea; the International Choral Festival in Taipei, Taiwan; International Federation for Choral Music Festivals in Belgium and Austria; and at Carnegie Hall in New York. The chorale is also a frequent performer at the American Choral Directors Association conventions, most recently in 2009, at the National Convention in Dallas, TX. The group’s diverse repertoire and showmanship include brilliant harmony and original stage presentation. Dr. Kim teaches advanced music theory and voice as well as graduate conducting courses and serves as program director of the MA in Music Program. He is the founding director of the University of Lynchburg Choral Union and directs the LC Concert Choir. He has been a guest conductor for many professional, community, and high school honor choirs and orchestras in the United States and Asia.